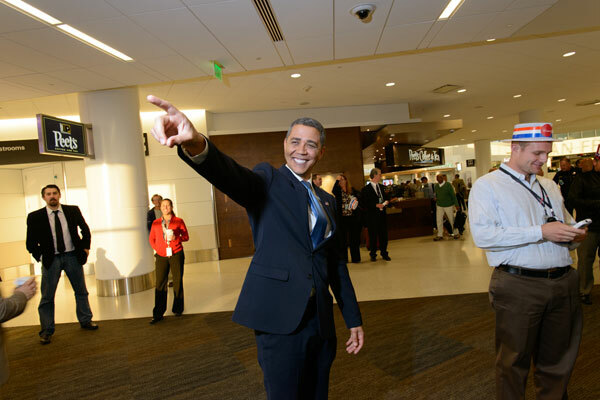 Guess who turned heads at San Francisco International Airport when he arrived to take Virgin America’s first nonstop flight to Reagan National airport? That’s right, Reggie Brown as Barack Obama. Photograph by Jeff Martin. A lot of fanfare for a flight that takes off at 8 AM. 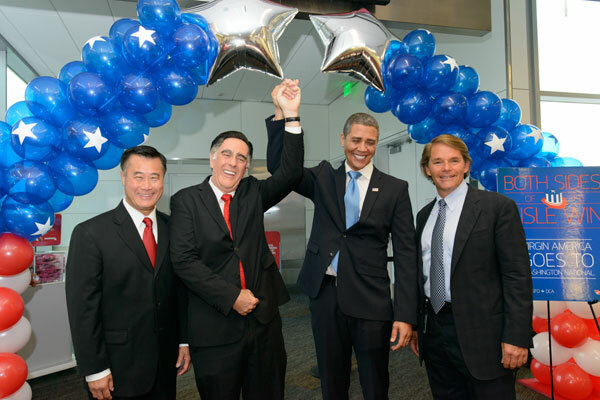 This is at the gate in San Francisco, with California State Senator Leland Yee, Romney and Obama look-alikes, and Virgin America CEO David Cush. Photograph by Jeff Martin. 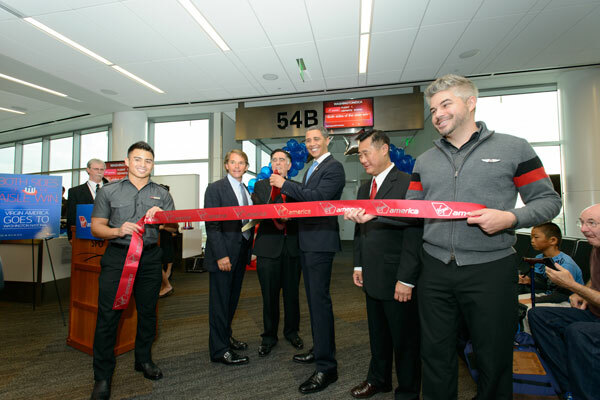 Cutting the red ribbon at San Francisco International Airport, David Cush of Virgin America, Romney and Obama impersonators, and California State Senator Leland Yee flanked by Virgin America staff. Photograph by Jeff Martin. 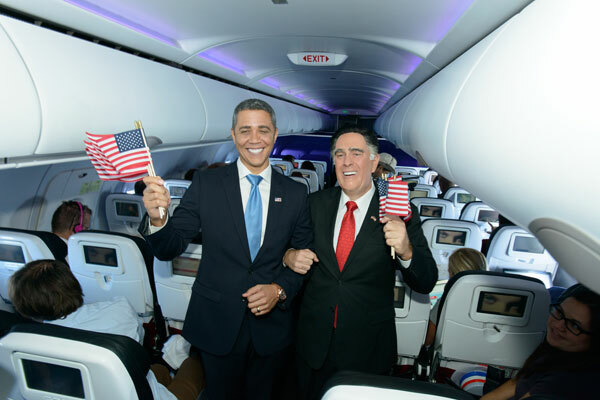 President Obama (impersonator Reggie Brown) and Mitt Romney (impersonator Jim Gossett) welcome passengers aboard Virgin America’s first nonstop flight between San Francisco and Reagan National airport. Photograph by Jeff Martin. “This is your president speaking.” Well, not exactly. 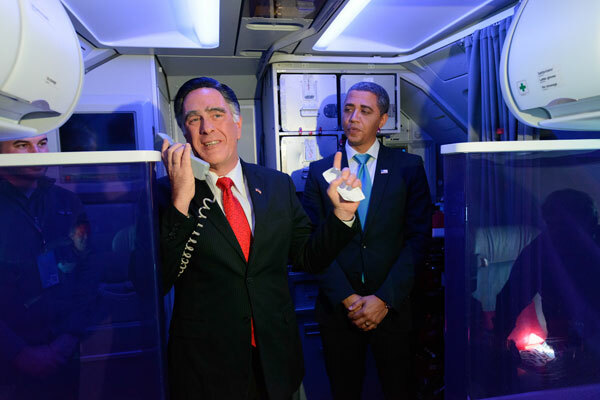 It’s pretend Barack Obama, played by look-alike Reggie Brown, on Virgin America Flight 1. Photograph by Jeff Martin. 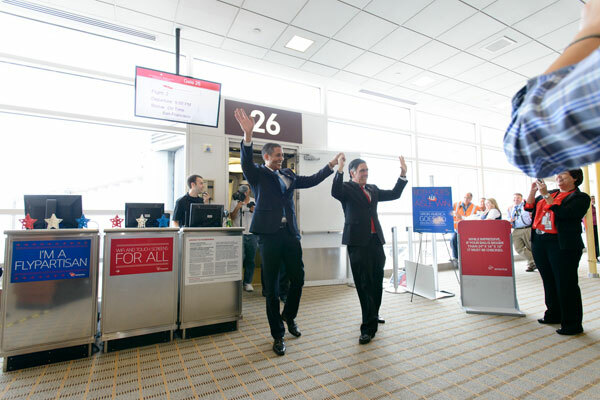 Mitt Romney (look-alike Jim Gossett) wrests the microphone from Barack Obama (look-alike Reggie Brown) to say a few words to passengers on Virgin America’s Flight 1 from SFO to DCA. Photograph by Jeff Martin. A political theme prevailed during the flight. 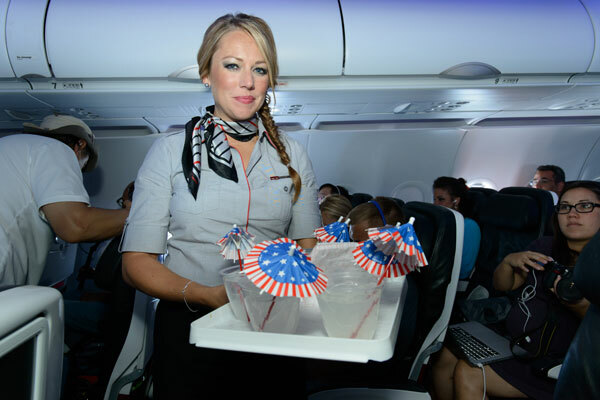 Here flight attendant Amy serves a special vodka drink to passengers. It was called the Camp David Cooler. Also served was the Air Force One (Bloody Mary mix, lime juice and Anchor Steam beer). Photograph by Jeff Martin. 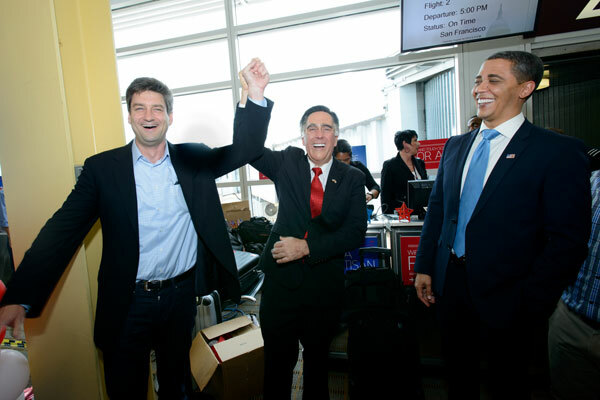 The 2012 presidential hopefuls arrive at Reagan National airport, first off the inaugural non-stop Virgin America flight from San Francisco International to Reagan National. Photograph by Jeff Martin. Completely by coincidence, a Paul Ryan look-alike was on the flight, political social media entrepreneur David Binetti. He was surprised to learn he resembles the GOP vice presidential nominee. Among the passengers on the inaugural Virgin America flight from SFO to DCA, travel blogger Gailen David and his regular flying companion, Fergie. 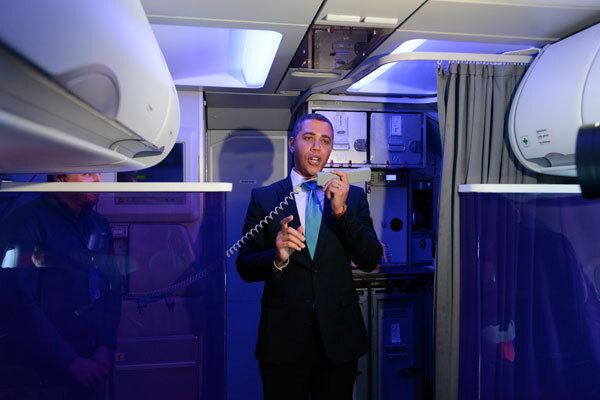 Onboard, the Romney look-alike offered to stow the dog on the roof of the plane, “because he would be more comfortable up there.” Photograph by Jeff Martin. 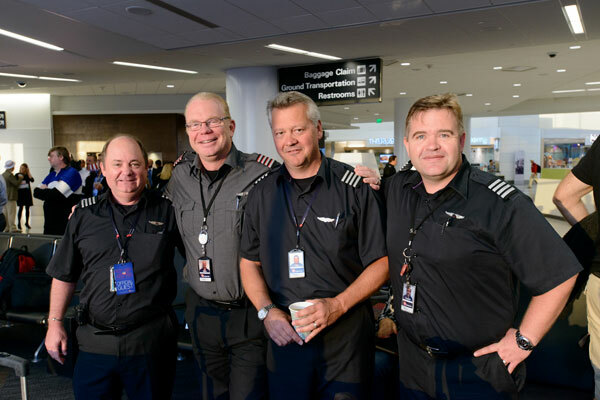 The Virgin America flight crew. Photograph by Jeff Martin. The Virgin Atlantic flight attendants: Ray Wong, Jay Morales, Matt Voges, Michael Kent, Jackie White-Leung, Keri Nielsen, and Ethan Pak. Photograph by Jeff Martin.